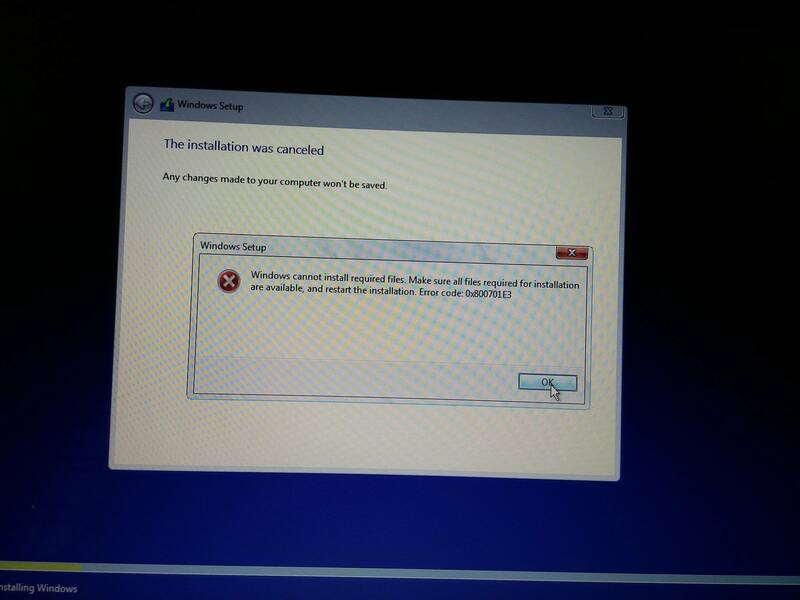 "Windows cannot install required files. Make sure all files required for installation are available, and restart the installation. Error code: 0x800701E3"
If you don't have a dedicated Windows 10 key, you must update first. After that you can clean install, once your machine has established its key with the MS servers. Use Microsoft's own Media Creation Tool for it, not rufus. The error 0x800701E3 is most likely related to your HDD hardware issues (e.g. too many bad sectors). CHKDSK to identify and fix errors in hard drives. Run System File Checker to repair missing or corrupted system files. The sfc /scannow command will scan all protected system files, and replace corrupted files with a cached copy. See: Use the System File Checker tool to repair missing or corrupted system files. Run S.M.A.R.T test (e.g. you can download WD diagnostics tool to check that). Run extended test on your HDD and check whether it's a pass. If it's external HDD, test above again with different USB cable (could be a bad data bridge). If your Windows installation is completely broken, try running it in a safe mode, otherwise boot from a live system or connect your HDD into another computer to run the tests. The S.M.A.R.T test can be also run from BIOS. Locate the malfunctioning device in the list of devices, right-click the device, and then click Uninstall. When a warning message appears that you are uninstalling a device from your system, click OK. Device manager uninstalls the device. Right-click the computer name in Device Manager and click Scan for hardware changes. Device manager scans your system and automatically reinstalls your device. Re-connect an external drive (unplug and plug it again) and run the installation again. If above tests fail, the drive needs to be replaced as soon as possible (check whether it's under under warranty). Try to repair bad sectors (e.g. run full scan to repair corrupted data using CHKDSK or other). If device is partly working, backup as much data as you can. Clone your partition into the image into another hard drive. Note: Make it clear that you need to recover your data. Addressing common issues with a hard drive head. Swapping the read/write head from a functioning hard drive (clicking sound). Replacing faulty PCB (electronics) from another compatible functioning drive. Swapping hard drive plates between a functioning hard drive. Purchase required HDD repair tools (e.g. from eBay, HDDSurgery, etc.). Carefully follow some of the instructions done on similar hard drives (e.g. on YouTube). Not the answer you're looking for? Browse other questions tagged installation windows-10 or ask your own question. Why is the Windows 10 installation process not showing all physical drives? How do I overwrite a corrupt Windows 10 installation while preserving files?